Anyway, they’re apparently sweetening their deals in an attempt to get more people in the door depositing money and I’m certain that’s exactly what this specific offer was designed to do. Now, I’ve made my feelings pretty clear on what a bunch of crap rewards programs are so it’s not sucking me in but, even still, I wanted to see exactly what 10,000 reward points might earn me. No sense in looking up the 1,000,0000 point prize — I’d never be lucky enough to win something like that. Yep. A toaster. What is this, 1975? Granted, it looks pretty nice… for a toaster. 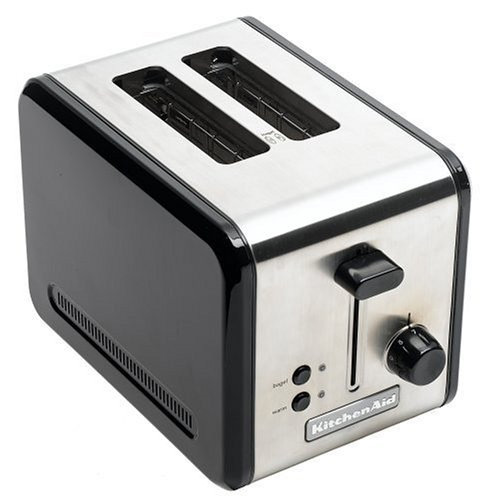 It’s the KitchenAid KMTT200OB 2-Slice Metal Toaster in Onyx Black and Stainless Steel. Usually it costs 13,900 points, which means that you’d have to charge nearly $14k to “earn” this toaster without this, um, generous offer. But as luck would have it, it’s on sale right now for $9600, err, 9600 points. For the record, this toaster is listed for $62.32 on Amazon. Shipping is free there — but it doesn’t come with a checking account.